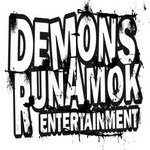 There are some cool news coming from the Demons Run Amok camp! The upcoming releases include: A Perfect Murder - Demonize 12"; The Last Stand - The Time Is Now 12"; The Fifth Alliance - Unrevealed Secrets Of Ruin 12"; Bitterness Exhumed - A Place Of Many Ghosts 12" and CD. Latest releases are new Suffer Survive, The Lowest, Dead Reprise and New Morality albums!